In this section are copies of original works of art. All of them are dedicated to helping us live according to unconditional love and compassion, which is the foundation of our peaceful means of bringing true and lasting peace to all of God's creatures, whether they are human beings or other animals. A medium-small parakeet native to north-eastern South America, often found in dry forests and palm groves but also in the famous flood-prone forests of the lower Amazon. 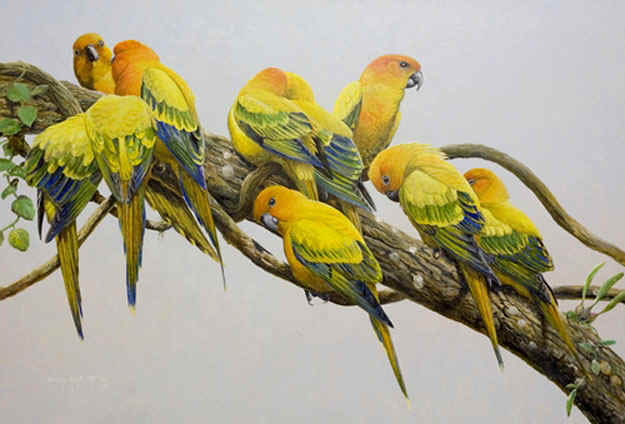 It is closely related to the Jandaya Conure (A. jandaya), which is found in north-eastern Brazil, and the Golden-capped Conure (A. auricapilla), which has a more southern distribution in eastern and south-eastern Brazil. At times all three have thought to be members of the same species. All three are also kept in captivity. While there are areas where they are common in the wild, conservationists are concerned about the effects of illegal trade on some populations. The painting is approximately life size, and is done in acrylics on compressed hardboard. I tried to show the social nature of these beautifully coloured birds. Barry describes himself as a Canadian artist/writer/naturalist.